Mayan Civilisation covered many parts of the Central American region, including whole or parts of such countries as Guatemala, Belize, Mexico, Honduras, and El Salvador. The civilisation thrived during what is known as its Classic Period between 250AD and 900AD, after which it abruptly collapsed. During this period, many Mayan urban centres with impressive architecture and thriving populations took birth. One such urban centre was Ek Balam which now is an important Mayan archaeological site in Yucatan, Mexico. It is located in the Northern Maya lowlands, about 25 kilometres north of Valladoid and 56 kilometres northeast of Chichen Itza. Ek Balam is said to have been founded sometime during the Middle Pre-Classic Period and remained occupied since then till the Post-Classic Period of Mayan civilisation. In this sense, it was one of the longest occupied urban centres of Mayan civilisation. The actual expansion of the city and growth of the population took place after the Late Pre-Classic Period. Soon after that, it became the capital of the surrounding kingdom. Ek Balam saw the height of its power from 770AD to about 840AD. During this period, impressive architecture and art was created in the city. After 840AD, however, its population began abruptly declining for which multiple theories are suggested. 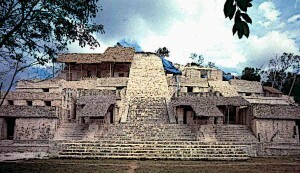 There are many tourist attractions at Ek Balam Mayan ruins particularly the architectural wonders built by the Mayans. Overall, there are some 45 structures at this site. This includes the city’s defensive walls which end on both sides at a steep sink holes. These defensive walls were erected during the Late Classic Period when warfare had become endemic in the region. Some scholars have suggested that it was actually the chronic warfare that resulted in the downfall of Ek Balam, like several other Mayan urban centres. In noteworthy architecture, there is also the entrance arch which stands on four legs at the entry of Ek Balam. The Oval Palace at Ek Balam Mayan ruins is an important architectural site. It contains the burial relics and it is assumed that the alignment of this structure was connected to cosmological ceremonies. The city also had a ball-court which was completed in 841AD. Structure 17 is the name given to the twin pyramids of the city which also have two mirroring temples on either side. Other architectural examples of Ek Balam Mayan ruins include the carved stela depicting a ruler of the city, steam bath, multiple platforms, the Temple El Trono, and others. One of the most distinguishing features of Ek Balam Mayan ruins is the defensive wall. The city is surrounded by two defensive walls which are concentric in nature. The inner wall surrounds an area of about 23.6 acres. Its carved stone is covered in plaster and it is 6.6 feet tall and 9.8 feet wide. The outer wall is simpler and has a sole purpose of defense, without any embellishment. Clearly these walls were erected to protect the city against the outside invasion which was becoming increasingly common during the Late Classic Period. In addition to these two large walls, there are also remains of other, smaller walls snaking through the city. So far only the centre of Ek Balam Mayan ruins has been excavated and it provides quite valuable information about the site. There are large, raised platforms that line the interior wall and surround the internal plazas. An important feature is the “scabe” roads which originate from the centre of the city and go in all four directions. These roads connected different parts of the Mayan kingdoms. Buildings inside the walls of the city are designed along the lines of northern Peten architectural style. The acropolis in the city also serves as the tomb of Ukit Kan Le’k Tok’, who was the ruler of the city during its peak time from 770AD to about 802AD. Wall paintings consisting of texts have been found on various locations in Ek Balam Mayan ruins, particularly in the room of the Acropolis. The most important of all these painting is called the “Mural of the 96 Glyphs” which is considered an invaluable work of calligraphy, just like another masterpiece called “Tablet of 96 Glyphs” found at Palenque. These wall paintings also depict various scenes from Mayan mythology and pictures of various deities. For instance, a painting depicts a mythological scene with a hunting deer which has been interpreted as the origin of death. The wall paintings and the texts provide important insight into the history of Ek Balam and Mayans. Compared with most other Mayan urban centre and archaeological sites, more is known about the history of Ek Balam Mayan ruins. The reason is that in contrast to other city states from the period, this site has been better preserved. Shortly after being abandoned, the city was covered by a rainforest, like many other Mayan sites. Detailed excavations of the site were performed as late as 1980s. Despite an age of over 1200 years, the details in the architectural and art of the city remains impressive. The first rediscovery and exploration of the site was performed in late 1800s but extensive excavation was not performed until a century later. The site was mapped in details in late 1980s after which more details were known about it and its relation with the Mayan civilisation. Ek Balam is one of the most important archaeological sites of ancient Maya located in Yucatan, Mexico. The city state of Ek Balam reached its zenith during the period between 770AD and 840AD and became one of the most important urban centres in the region. However, after 840AD it collapsed in an abrupt manner, like many other Mayan cities. Ek Balam Mayan ruins contain some important sites of Mayan architecture. For instance, there were the concentric walls of the city, the Temple El Trono, and multiple raised platforms, among others. The city was connected with other city states through unique Mayan roads called “scabe”.